Here’s a quick test for you: Search for the ticker symbol of one of your firm’s funds, a big one, a small one, it doesn’t matter. How many searches do you suppose your site loses to Google Finance, Morningstar and Yahoo Finance, the sites linked to at the bottom of the ticker symbol graphs? There’s no need to guess—just check your Webmaster Tools account (Search Traffic/Search Queries). You’ll likely see that your site is being displayed in search results for ticker symbol searches (Impressions) but that you’re not getting the majority of the clicks. In all likelihood, the information that Google is providing to ticker symbol searchers right there on the search results page is either 1)satisfying the searcher or 2)driving the searchers to Google, Morningstar, Yahoo fund or (for ETF ticker searches) even MSN Money profile pages. Ouch. This especially hurts because ticker symbol searchers are the most qualified site visitors you could ask for—no doubt you’d prefer them to come to your site, sign up for an email newsletter, ask for more information, check out other funds… Opportunity is being lost because Google (and Bing, too, by the way) siphons interest in the ticker symbols of your products and reroutes traffic. Now, competition for organic search rankings is one thing. If the authority of your domain is lacking or if you haven’t taken the appropriate SEO steps to lift the visibility of your fund pages, well, then, you’ve had your fair chance and didn’t step up. But this extraction of structured fund data from a third-party database is different because it’s completely beyond your ability to appeal. The publishing of fund prices on the search results page has been going on for years. My sense is that asset management digital marketers are desensitized to the traffic/attention that’s being lost. Do you remember that parable about the frog in the water? 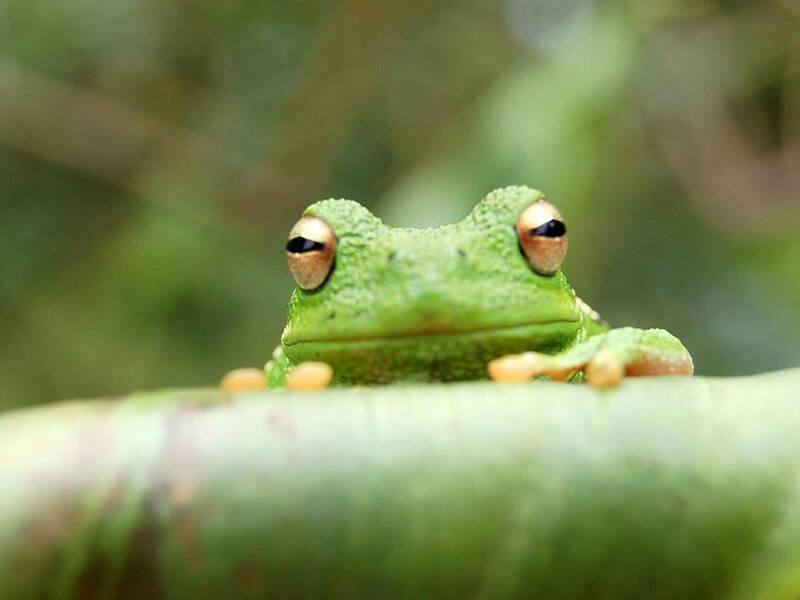 As long as the water boils slowly, the frog won't jump out because he doesn’t perceive danger. As it turns out, asset managers have had an early taste of what many site publishers are now experiencing due to Google’s implementation of what it calls the Knowledge Graph. The Knowledge Graph, according to Google’s 2012 introduction of it, enhances search by narrowing search results, summarizing relevant content around a search query, and facilitating deeper and broader searches. "It currently contains more than 500 million objects, as well as more than 3.5 billion facts about and relationships between these different objects. And it’s tuned based on what people search for, and what we find out on the Web," Google wrote three years ago. Knowledge Graph-driven search results have become more prevalent in the last year. The goal of Knowledge Graph information, whether displayed in answer boxes immediately below the search box or in a panel to the right of the search results, is to instantly provide an answer that’s relevant to a search query. Relevant answers delivered on the spot are increasingly important as more searches take place on mobile devices. The fewer clicks required on a smartphone, the better. This is an expanded role for Google. As opposed to just directing search traffic to the most relevant Websites, it’s now taking it upon itself to try to answer search queries. For a current overview of the various search-related initiatives underway at Google (i.e., Voice Search, Knowledge Graph, Google Now), see this Medium post, part one of a series. About 25% of search queries today produce Knowledge Graph answers, according to author Steven Levy. While fund sponsors never made a peep about Google effectively hijacking searches for ticker symbols, many Website publishers who explicitly monetize their sites are upset and confused about the rise of Knowledge Graph. 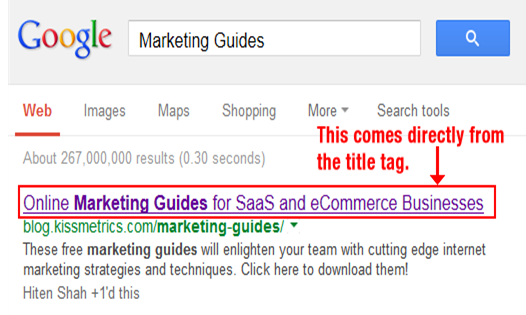 Some object to Google’s “scraping” their sites to extract a result to show in a Knowledge Graph answer box. It’s a backhanded compliment—Google thinks enough of the site to extract answers from it, but that results in a loss of visitors to revenue-producing pages. It’s easy to see the value that’s being provided to the searcher. If all a searcher wants is a basic definition of ETF, this Knowledge Graph extract from Nasdaq.com might be enough. If the searcher wants to dig further, Nasdaq is in an advantaged position to get the click from the added prominence on the search results page. Consequently, some search engine optimization experts are pivoting into Knowledge Graph Optimization. Sources of the Knowledge Graph include Google+, Wikipedia, Freebase and Schema, which is structured markup added to Websites to clearly identify standard elements that Google may want to lift. Following the markup standard for Customer Service phone number, for example, can result in Google extracting the number and publishing it with the search results. Knowledge Graph Optimization prepares Website content for what is effectively syndication of granular content. But not all SEO experts or Website publishers approve of this appropriation of content. Many are product manufacturers, like fund companies, and they’re insisting that they should be able to be both the authoritative source of information and a search destination. For two perspectives, see Knowledge Graph 2.0: Now Featuring Your Knowledge and Knowledge Graph: Does it Make Sense to Optimize for the Google Scraper? So, where does this leave the asset management Website and Web strategy? I remember how shocked my team and I were back in the day when we saw the first analytics that revealed that our site’s Daily NAV pages were the most popular pages. That made sense then for two reasons: 1)This predated the fund data aggregators and 2)advisors habitually used multiple funds from the same fund family—a late afternoon or evening visit to the fund sponsor’s Daily Prices page was all they needed. The bleak future of sites that relied on single-page visits to pages whose data could be found elsewhere didn’t dawn on us until later. Let’s turn now to your Web analytics. How much of your traffic goes to your product pages? Today, you may be missing out on ticker symbol searches, but my guess is that you’re still getting the traffic from people who are searching for your products by their names. This includes a long tail of searchers using a creative mix of how they spell, remember or type fund names. Such keyword searches are increasingly giving way to semantic searches, in which Google considers user search history as well as other contextual signals. It’s just a matter of time before Google looks at those incomplete, hastily entered fund names, automatically does the translation and understands that the searcher is looking for a fund. The fund data graph will be what's displayed as the top search result for all those searches, too. The goal is to provide information fast, remember, and displaying the graph with the table of basic return, expense and asset size data is faster/more useful than just offering links to an asset manager fund page or, God forbid, PDF of a fact sheet. The implication for your site: More traffic (opportunity) lost. This is your risk today. I make the assumption that traffic to your domain is something you want to protect, if not build, for a multitude of reasons that start with brand awareness and lead right up to lead scoring and predictive analytics initiatives. Use the data available from Webmaster Tools and your Web analytics to get a handle on what’s what. Make sure you understand the sources of traffic to your fund pages and their value to you. How many anonymous visitors convert to newsletter subscribers or registered advisor site users, for example? How much of the traffic that Google sends to Google Finance, Morningstar, Yahoo Finance and MSN Money finds its way back to your site—how much as a result of the editorial versus advertising? Track all changes in your volume of search traffic and sources over time. Confront the obvious: Why would a fund searcher be better off coming to your site as opposed to another site? If you’ve researched a car in the last few years, you know that there are some automobile manufacturers that deliver superior, differentiated experiences on their Websites. Car buyers who rely exclusively on an Edmunds.com or other car review site are missing something if they don’t check out the configuration capabilities and other bells and whistles offered by the manufacturers. What information can you uniquely offer and attractively/interactively present for product tire-kickers? By the way, I had the “So, what’s so special about the fund information that appears on your site?” conversation with someone recently, and she answered, “We’re the only source of our capital gains distributions.” Well, OK, that’s a start. Those pages command a lot of eyeballs at this time of year. And yet, very few firms use the margins of those pages to cross-market or otherwise communicate. There’s no stopping Google so control what you can control—give the site visitors you attract better information and a better experience, and that includes when on a mobile device. If you think your site offers worthwhile, appealing features and data that deserve the attention of fund data searchers, promote it. Don’t sit back and expect site visitors to find it. Make sure your wholesalers are versed on the depth of the fund data available on the site. Promote it on the home page, throughout the site and consider targeted pay-per-click ads. As of now, you can still buy your way to the top of the ticker symbol search. As Google gets more grabby to protect its own value proposition, you need to be more aggressive, too. Finally, if you can’t fight them and win, join them. Google’s evolution of the Knowledge Graph (whose answers are extracted from only the first page of search results) gives you just one more reason to commit to publishing authoritative mobile-friendly content that’s optimized for search. If you’re in the online content business, such physical signs of positive reinforcement are hard to come by. But, know that what you do is appreciated and often celebrated. The following list contains 22 pieces of content. I cheered these gems when I learned about them at one point or another in 2013 and they've stood the test of as much as 12 months' time. As in previous Rock The Boat Marketing annual content highlights (last year’s), this is an idiosyncratic compilation across multiple digital marketing subject domains. Most of these I like for their content, some for their design, their delivery or the evolution they represent. They're presented in no particular order. Want to play along next year? Come join me on Twitter where the majority of these highlights were surfaced by the awesome information hounds I either follow or am led to. In 2013, I also explored more content on LinkedIn, Google+ and Pinterest—follow me on those networks or just check in once in a while on this site's Resources page. The results that Google presents to you the searcher are based on how it “understands” the words you type into the search engine. You know what you want but your search query may have literal meanings that you don’t intend. This excellent Vertical Measures graphic from April details what Google has in place to read your mind, and how that's evolving. The screenshot below is just a slice of the full infographic. Part of being social is taking part in the broader community. Quite a few mutual fund and exchange-traded fund (ETF) firms seemed to acknowledge that this year with how they managed their social accounts. We saw more accounts following others, more sharing of others’ content and an occasional #FF (Follow Friday) recommendation. No less than PIMCO’s Bill Gross acknowledged that investment and economic insight takes a village—and people showed a lot of interest in who influences this influential money manager. From August, this is one of PIMCO’s all-time most favorited tweets. It would have been too much to expect him to use the Twitter handles. 3. And We Are Doing This Why? “…The silence around the economics of content is deafening,” says Forrester analyst Ryan Skinner in this July post 16 Ways to Turn Content Marketing into Business Value. Skinner then proceeds to break down what he names as catalysts of content marketing value: brand, next click, relationship, reach, data. Many firms aspire to be content factories today, which is all well and good. Before you plow ahead into production, read the Skinner post to make sure you’re aligning what you’re doing with what drives value. It’s a good idea to present yourself as authentic and transparent. But, um, as this Tom Fishburne cartoon from June suggests, you may need to bring that in-house. Marketers need to be more analytical. That drumbeat got louder and louder as the year progressed. If you’ve ever found yourself looking for Excel training applied for marketers online, you may be happy to learn about this Excel dashboard series. Written by Annie Cushing and augmented by a video or two, it started in June on Search Engine Land and then continued on Marketing Land. This November update isn’t on the list because the content is break-out. It’s a little more Facebook-y than I like for Google+. But it’s an example of how the largest mutual fund company is not just experimenting but succeeding (relatively speaking) in engaging people on a social network that most investment companies have decided to ignore. 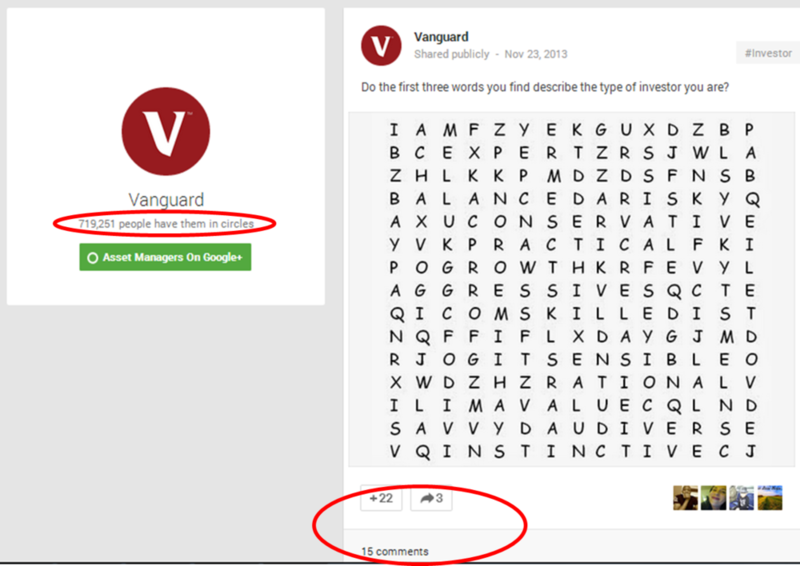 More than 700,000 people have circled the Vanguard account, 22 people +1ed this post, three shared it and 13 commented. And, what other social network (i.e., somebody else’s platform) provides such open real estate (no ads) for your message and yours alone? Infographics were so 2010. 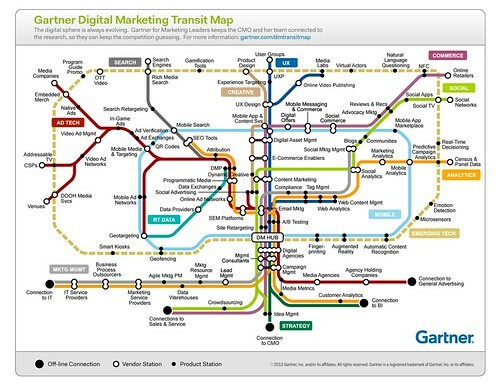 Still, I couldn’t resist spending several minutes of my life with this Gartner Digital Marketing Transit Map released in June. Gartner says, "Organizations should use the map to identify the connection among business functions, applications tracks and providers. Map elements can be used to find additional research or structure questions about strategy and best practices as well as providers, products and selection criteria. It is also a useful device for mediating discussions between marketing and IT." Show this to the people in your life who think all digital marketers do is email and the Website. Advertising a financial advisor-only conference call? On Twitter? By Royce Funds? Yes, yes and yes. In October, Royce Funds showed its leading edge lead-generation chops by employing a Twitter card to drive sign-ups. Design is rarely front and center for digital marketers, and yet it's especially important at a time when so many clients and prospects access information via mobile devices. You’ll take a lot from this Prophets Agency presentation published last January—and follow the account to learn when the 2014 outlook is available. 10. Where Do I Sign Up? Few of us have high expectations when we go to a conference Website. Oh sure, the highest-profile events command the resources to deliver a functional, pleasant experience, but the majority of event sites lack luster. That’s not the case with this vibrant LPL Connect 2013 site. I’d bookmarked it during the August event (which I attended by hashtag only) and hoped it would still be reachable when I returned to it for this list. Outstanding—not only did it not go dark after the event, it’s been updated. Why would you go to a conference site afterward? Just one reason, probably. LPL lets the presentation archive dominate the home page, while most event sites require attendees to go looking. All that’s missing from my cursory review of the site is a Search capability. TD Ameritrade knew there was value in providing insights on what its investors were thinking. Previously, according to their Website, they'd satisfied media and others’ requests for information with opinion surveys. That approach was upgraded considerably in January with the release of a quantitative, behavior-based index that reports on what retail investors are actually doing. The Investor Movement Index, based on a sample of the firm’s 6 million accounts, is a tool that has ongoing marketing and communications utility. It raises the bar for other investment companies whose proprietary data contains insights when aggregated. Wouldn’t it be cool (and ostensibly instructive) to someday get a full picture of what investors and 401(k) participants are doing, via a single site driven by the sampled and anonymized data from individual brokerage and investment firms? Nowadays, people are relying on mobile devices to share what they see around them and especially the news. We all need to plan accordingly. Not that you needed the previous two sentences after looking at these photos comparing people anticipating a 2005 papal announcement in St. Peter's Square, Vatican City, and those in March 2013. From Google Earth to Reddit to Twitter, the Internet was focused on April’s Boston Marathon-related bombings. From my perspective, this is the best content that came out of it. The rest of us were worried about Bostonians. In an inevitably schmaltzy way (is there any other when Neil Diamond is involved? ), this video demonstrated their resilience. Google’s search engine results page (SERP) changed big-time in 2013. In October Moz provided a visual guide to all the variables that could possibly appear in (mostly organic) search results and why. Study the full guide (the screenshot below is just an excerpt) but don’t bother printing it—things may have changed since you started this post. It’s about something—the world's water crisis—as opposed to being a container of investment commentary and investment product information. The embedded video is effective at using the medium to communicate more than just words and images could. Its Daily Drip is an aggregation of others’ (non-Calvert) views and updates. It offers the tweets of not just the firm but three analysts using a #CalvertH20 hashtag. It includes a "Play" feature that uses the device's camera to simulate a water effect. Kinda corny but something to build on. You could land on any blog post on Avinash Kaushik’s Occam’s Razor site and find Web analytics gold. 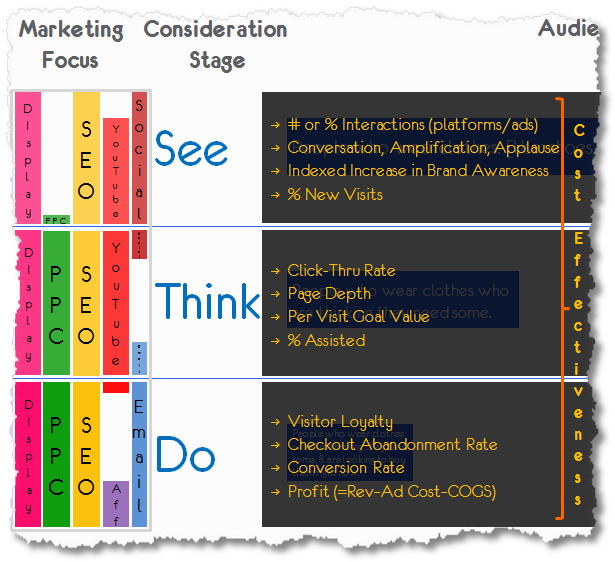 But, make a special effort to read See-Think-Do: A Content, Marketing, Measurement Business Framework. Your entire day every day can be filled in the pursuit of digital marketing tactics. This post is a nudge to be more strategic in how you think about your work and its effectiveness. BREAKING: Sorry, I can’t let this post fly without also mentioning a December post in which Kaushik lays out a digital marketing “ladder of awesomeness.” Another must-read. You might just want to subscribe to this site. A chuckle is the last thing I expect when I log into LinkedIn but, no kidding, some of the photos being used for profiles are funny. This MarketingProfs 19 More Reasons Your LinkedIn Headshot May Be an Epic Fail presentation is not exaggerating. Too bad it doesn't touch on one of the types of photos I commonly see. Men in tuxedos, really? Last week was all about learning an hour of code. I’m guessing most of you sat that one out. But this week, how about learning to just read the source code on your Website? If your work has anything to do with optimizing your site for search engines, this KISSmetrics post from August provides an excellent foundation for how to confirm what's happening on your site. Bonus: Check other sites' source code to learn what they're up to. This screenshot is just the first example the post provides. First there was the dramatic reading by James Earl Jones and Malcolm McDowell of Jenna’s Facebook for a Sprint commercial. I loved that. Moving onto the digital realm, on YouTube two actors re-enacted a YouTube comment war between two One Direction fans. But the investment industry has nothing to do with most memes. We wouldn’t do the Blurred Lines knock-off videos, twerking is out of the question, and the President of the United States took part in a selfie before an asset manager CEO has. So, while I suffered along with other financial services marketers when the #AskJPM Twitterchat imploded, I have to say that a subsequent CNBC video published the next day thrilled me. Stacey Keach provides the dramatic reading. It didn’t go anywhere (just one tweet!) but let history show that this may have been the first stab at a meme. Thanks to my buddy Todd Donat for first sending me the link to this. Too soon? I hope not. When one Website sneezes, do the other Websites catch a cold? Nah, the failings of healthcare.gov just inspired Slate in October to show how iconic sites Facebook, Yahoo, Amazon and Windows would have made the site over in their own image and likeness. Pretty genius. The introduction of data, including visualization, can add to the usefulness of content you’re creating. But this is yet another competency that people in marketing positions today will have to learn on the job. Most likely, you will not be crunching the numbers, you’ll be managing the data-driven work. To be an effective partner and contributor you may have to dig in. It was prepared for journalists and not marketers, but the Data Journalism handbook may be just the resource you need. The handbook, a version of which is also available in print, is a project of the European Journalism Centre’s Data Driven Journalism initiative. The Marketing Arm’s Tom Edwards, the author of this contribution to iMedia Connection, sounds like he has one cool job as an evaluator of interactive/new media and emerging tech. We’re the beneficiaries as he outlines—and provides plenty of examples of—six marketing technology trends. Included: collaborative commerce, curation, second screen and social TV, rich social media, crowdsourcing and social and CRM. The screenshot below shows the user interface of a social TV app. This post will do it for me for 2013. Happy Holidays to all and see you back here in the first week of 2014! What role does SEO play in your firm’s Marketing? Many companies we work with don’t invest a lot in search engine optimization. But the companies that do tend to swing over to the other extreme—they tend to have a deeper appreciation for how search drives website traffic and, because of this, they invest many of their hopes and dreams into their SEO efforts. In many cases, that’s not practical. SEO can’t on its own rescue an online presence, and particularly not if an SEO team is siloed. What an organization knows and understands about SEO can be leveraged many times over once the search professionals are mainstreamed with the rest of Marketing, including writers and producers involved in creating content to be marketed and syndicated. It doesn’t happen often but sometimes the Universe helps with the blog-writing. All week I’ve vacillated between two disparate topics: the Roth IRA Conversion Centers that are appearing on asset managers’ Web sites and pay-per-click (PPC) content advertising. Thanks to the Universe for showing a way to address both topics in a single (OK, little long) post.